Smoothies have been ruling my world lately. 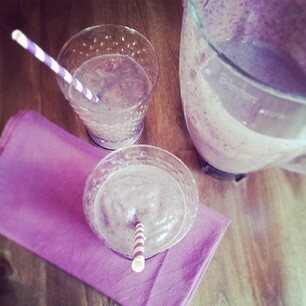 The newest one is the Avocado Blueberry Smoothie with Almond Milk and Flaxseed. It’s nice to have a dairy-free version of the smoothie and this one can be made with soy or rice milk as well. In the heat of the summer, do use fresh berries if you can. Though, frozen berries will make this breakfast especially frosty. Avocado adds incredible richness and makes this smoothie creamy and decadent. Ready to give it a whirl? 1. Combine all ingredients in a blender and blend. Add more milk, as needed to reach desired consistency.